Most games these days seem to have a supported "shelf-life" of about two years. That time is even shorter if the game is pretty much universally billed as "one of the worst games ever." But that didn't stop the developers at Spiral Game Studios and TREK Industries when ORION: Dino Beatdown was released. After three years of updates, fixes, tweaks, game title changes, and improvements, ORION: Prelude has gone from one most criticized and unpopular games on Steam, to one of the best. David Prassel of TREK Industries shared with us their story. Back in 1998 I started penning a prototype under the code-name of 'Incoming' which would later become known as Orion. The first decade was spent developing the overall idea and this included the general story and time line of events, the characters, species, weapons, planets and anything in between. This is basically what I call the ‘Orion Construct’ and it consists of millions of files, documents, designs, sketches and notes. This allows us to quickly pull what we need from the Orion Universe and then quickly develop a game design within any genre. With it we built a variety of prototypes experimenting with different phases and varieties of development. As a gamer I grew up on FPS. Sure I played all of the other Nintendo/Sega games but I didn’t become addicted until playing Quake 2 CTF at the age of 9. This later grew into gaming obsessions like Unreal Tournament, Counter-Strike, Tribes, the Jedi Knight series and so many more. So the first game type that we had to make was just a great and fun shooter built for friends. In 2008 and 2009 we built and put together a free mod for the Valve Source Engine. 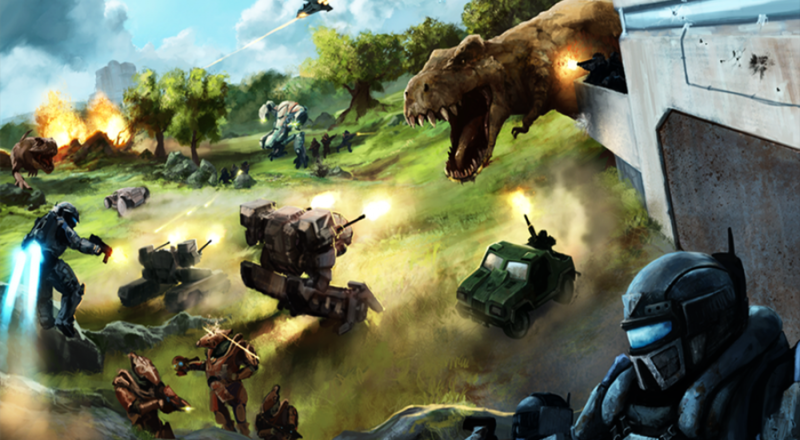 It was called the ‘ORION: Source Prototype’ and it focused on Weapon Combat and Player Class mechanics, while leaving other major features like Dinosaurs and Vehicle Combat on the side lines. We released this to obtain as much community feedback as possible before beginning production on the first “real” Orion game. The ‘ORION: Source Prototype’ ended up winning FilePlanet’s Mod Of The Month for January 2010 and had tracked over 100,000 registered downloads. We updated it continuously and put out the last major update (v1.2) in June 2010 before migrating to the new title. After months of research we decided to move forward with the Unreal Technology platform as our primary game engine for the next decade. 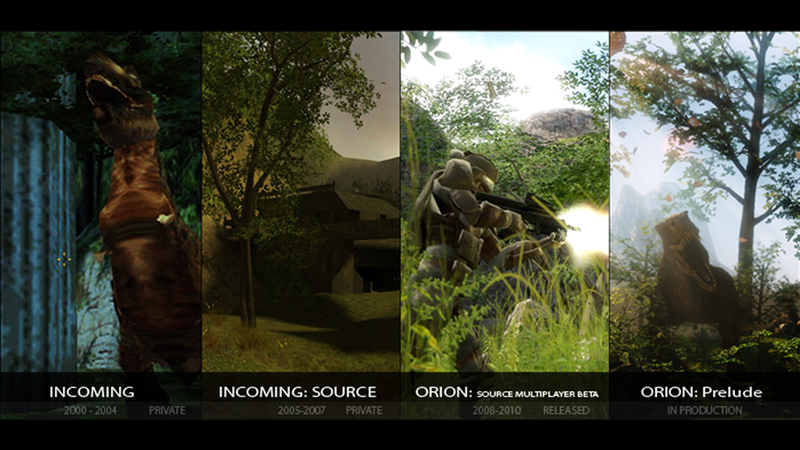 In the Summer of 2010 we began production on what would end up powering the first official Orion game. We acquired the appropriate licenses and began work immediately. We decided on the game name of ‘ORION: Prelude’ which was to act as a precursor towards where we wanted to go both as a company and a gaming IP. This was over the top, retro-inspired and focused on friends. I spent much of the Summer seeking like-minded individuals looking to build something incredible together, regardless of just coming from the modding scene with absolutely no production money other than what was in my pockets or account. At this point I had involved my brother who worked out in London as a Trader to come aboard and handle the business aspects so that I could better focus on the actual game development, design and production.